Brockville, Ontario – The Ottawa Jr. Senators (31-12-3) fell 3-2 to the Brockville Braves (31-9-3) in shootout on Friday night at the Brockville Memorial Center. The Jr. Senators salvage a point in the loss and are now tied for third with the Braves in the CCHL standings (65 points). The Jr. Senators now trial the Carleton Place Canadians (67) by two points and the Hawkesbury Hawks (66) by point point in the standings after both of them picked up wins last night. The Braves, on the other hand, have two games in hand on all of the teams in the top five. Ottawa drop’s the season series against Brockville (1-3-1) after they met for the fifth and final time on Friday. During the season series, Ottawa was outscored 14-to-13. Last year, Ottawa went 4-0-1 against Brockville. After Brockville’s Emerick Nadeau scored in the fifth round of the shootout, Ottawa’s Chris Piche had to score to tie it, and goaltender Antoine Bourdeau shut the door with a pad save for just their third shootout win of the season. Ottawa falls to 2-3 in shootouts and 4-3 in extra-time. The Jr. 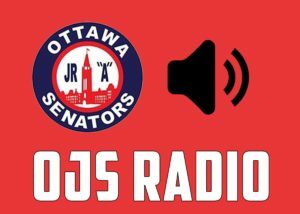 Senators three game winning-streak ends. They are now 6-1-1 since the break. Darcy Walsh (1G/1A) scored his league leading 27th goal of the season and Kyle Jackson (1G/1A) extended his goal and point-streak to four games. Francis Boisvert made 28 saves in the loss. The shots were 34-30 for Ottawa. They went 0-2 on the power-play, snapping their streak of scoring a power-play goal in five straight games. Their next game in on Sunday January 27th, 2019 against the Pembroke Lumber Kings at the Pembroke Memorial Center. Puck drop is scheduled for 7:00 p.m. You can catch the broadcast on mixlr.com/ojsradio.